These are adorable for a Halloween Party or to make with your kids! 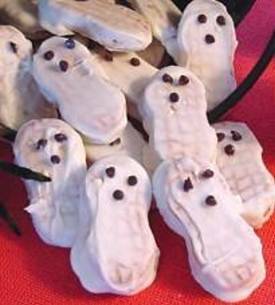 Spread each Nutter Butter cookie with white frosting, then make little eyes with the chocolate frosting (or mini chocolate chips, if using) and you have ghosts! Servings: Make as many as you like.